According to the American Pet Products Association, more than 19 million dogs wear a collar daily with an upwards of 26,000 collar strangulation accidents that occur to those dogs each year. 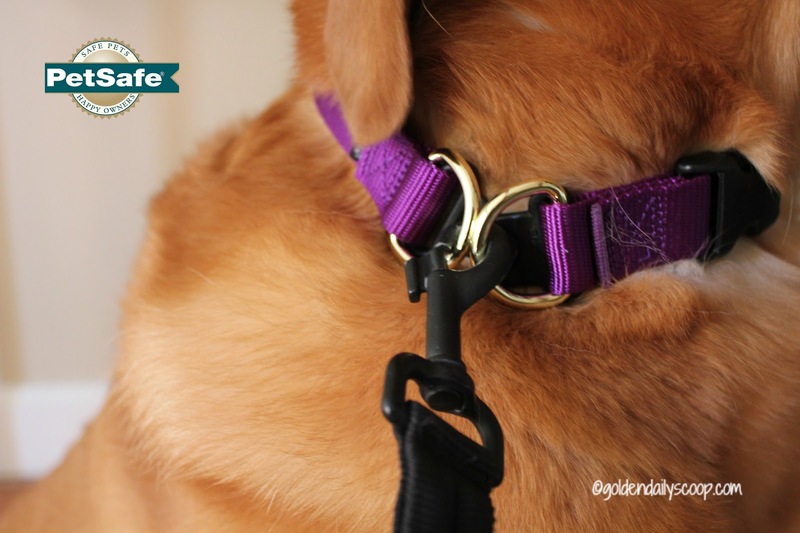 Golden Daily Scoop received a KeepSafe Break-Away collar from PetSafe to review and help spread the word about pet strangulation. All thoughts and opinions are our own. PetSafe is not responsible for the content of this article. 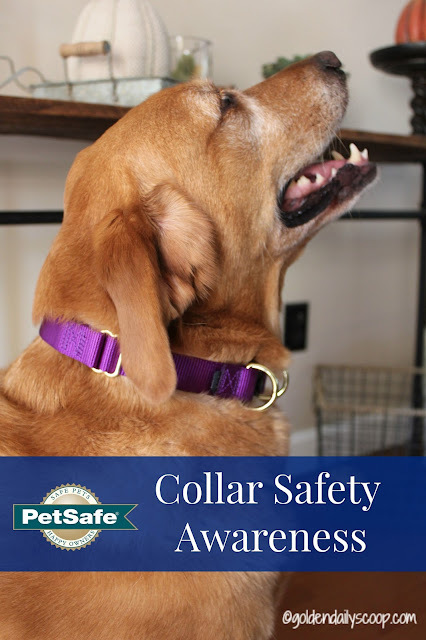 To coincide with National Animal Safety and Protection month, PetSafe® is celebrating it's second annual Collar Safety Week by educating pet owners and professionals about the risks of strangulation and dangers associated with traditional collars. Where Can Collar Strangulation Happen? 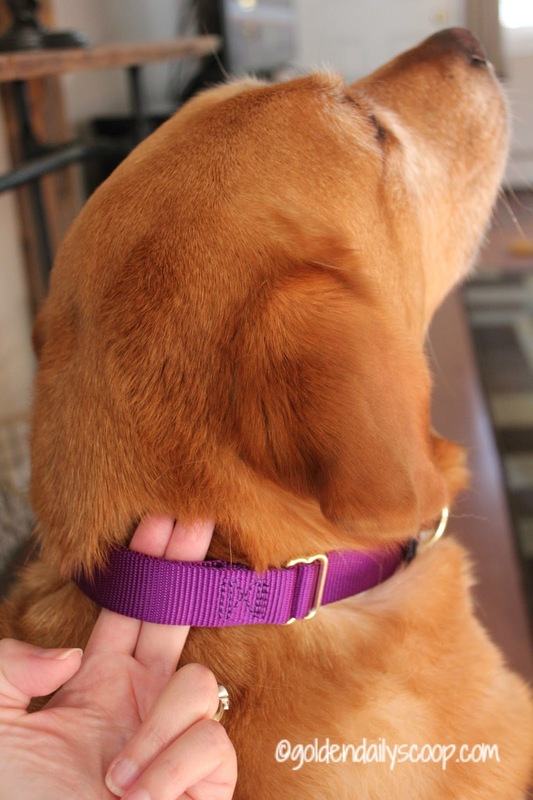 Designed to prevent dogs from getting entangled by their collars, the PetSafe® KeepSafe® Break-Away Collar was invented by Tenney Mudge after the devastating loss of her beloved dog, Chinook, to a collar strangulation accident. The collar features a patented break-away safety buckle that releases when pressure is applied or it gets caught on something, allowing it to fall off harmlessly and reduce the risk of strangulation or injury to the pet. This collar can be put on your dog just like an ordinary collar with a buckle making sure you can fit two fingers under the collar. Note: If you have to restrain your dog, grasp the collar around the break-away buckle, otherwise the collar may release and your dog will be loose. The KeepSafe collar also has a metal D-ring on each side of the breakaway buckle, which can be used to attach ID tags and can be clipped together with a leash so pet parents can safely walk their dogs using the collar. PetSafe has developed an informative video and infographic to help pet parents protect their dogs. I would love to win a collar because we take my dog hiking and swimming a lot and I want her to be safe! we have never had any collar injuries but it is definitely a big concern. this is a great idea! I've never heard of a dog getting strangled by their collar but I am sick just from the thought of this. Thanks for this sharing this article so we can all become better educated pet parents and make better decisions with the collars we purchase for our fur-kids. Would like to win to keep my dogs safer in their crates and when playing. To keep my dog safe. He got caught on the fence once and it was almost fatal - this wouldn't happen with this collar. 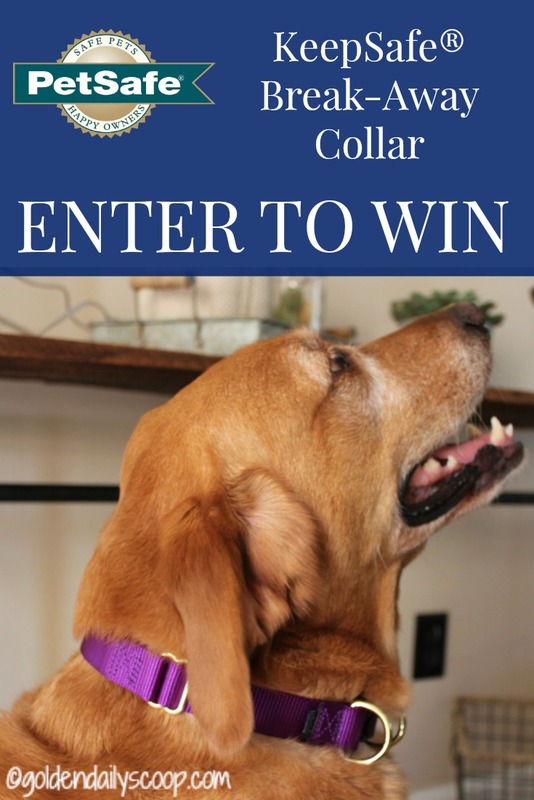 i would like to win one b/c i think it is a safe way to have a collar on your dog. right now, i remove my collars in the house and when my girls dont need them. i do this for fear they could get their collar caught on something when i am not around. i also remove them when they are in the their outside pen so they wont catch them on anything and choke themselves. 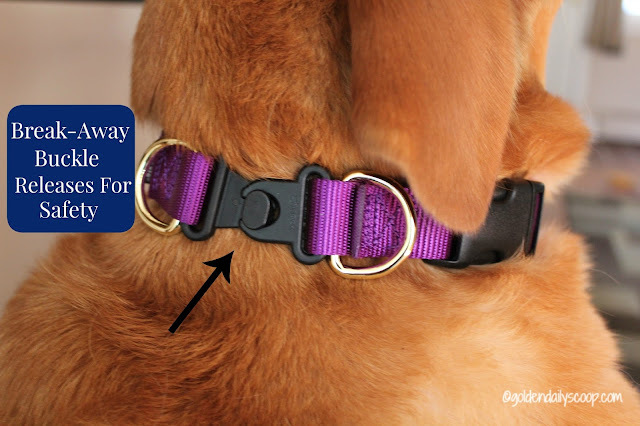 it is a safety feature that is needed on all collars. 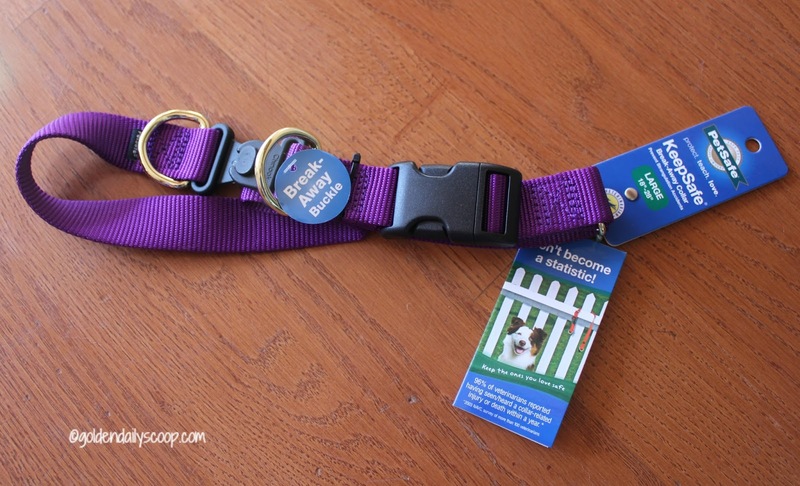 the place I board my dogs require a collar like this. this one looks much better in quality then the ones I currently have. Our great dane likes to get herself into all kinds of situations. A collar like this would mean peace of mind. my dogs safety is my number one priority. anything i can do to make sure she is always safe, i want it! I have always been scared that a collar would get stuck on something. This would be great for my Boston. I have an adventurous dog who is always getting into situations and I want her to be safe. I would love to win just for peace of mind. My baby girl is a little over 1 year old so she is still very spunky. Id love to win one because my Siberian husky actually got his collar stuck on branches last year and kept turning himself to free himself. That only madebit worse so thank god he was near the shed so I was able to get cutting shears and cut the branches and his collar off to free him. That was such a scary day. I would like to win this because a neighbors ctr was missing for a few days and luckily it was found but its collar had gotten stuck on some brush and that is why he couldn't get loose. I would hate to have something like that happen to one of my pets. I usually use harnesses on my dogs when they go out- there is less chance for them to choke of it gets caught.